Overwhelmed with your search for an experienced but affordable wedding photographer in San Diego? With 20 years of professional photography experience, and after more than 450 weddings, J. T. MacMillan Photography has you covered on this most important of days. J. T. began his career in the competitive world of metro daily newspapers, shooting for newspapers like the San Diego Union-Tribune and the Los Angeles Times. Performing under tough daily deadlines, he is no stranger to pressure, and likens wedding photography to spot news photography. You've got to get it right the first time, period. 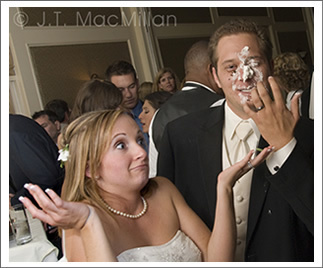 J. T. brings his extensive background in that documentary-style photography to each and every wedding. Combining the classic approach of beautifully-lit and posed wedding formals with the spontaneous coverage that has a photojournalistic edge, J. T. MacMillan Photography offers the best of both worlds. After 450 ceremonies, we've seen it all, and remain the calm in the storm at every event we photograph. Our technique is second-nature, so we can concentrate on making the experience fun and the photos uniquely yours. Your wedding images are a photo documentary of this most important day; a collection of images full of action and emotion, expertly photographed... and unforgettable!